(CNN) -- Race fans have a big Memorial Day weekend ahead. Open-wheel cars at the Indianapolis 500. Stock cars at the Coca-Cola 600. 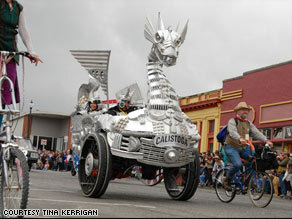 A dragon made of aluminum scrap was one of the entries in 2008's Kinetic Grand Championship in California. But if you need a different sort of racing fix, maybe you'd be into fire-breathing aluminum dragons. Friday kicks off Northern California's annual Kinetic Grand Championship, a three-day race in which teams aboard pedal-powered works of art move across 42 miles of road, sand and water. Thousands of spectators, some following the competitors on bikes of their own, watch kinetic sculptures like a picnic basket and a psychedelically painted hippo race from Arcata to Ferndale in California's Humboldt County. But we start with California's kinetic sculpture event, just one day away. The Kinetic Grand Championship bills itself as the oldest race of its kind. It started in 1969 when renowned welding artist Hobart Brown challenged someone to a welded-contraption race in Ferndale, California. Now, about 40 teams create art of varying complexity and attach it to something that can be pedaled on land and float on water. For the floating part -- the sculptures go into Humboldt Bay on Day 2 -- some have tires big enough for the job. Others rely on pontoons. "We call it the triathlon of the art world," race director Harmony Groves said. "It brings together art, engineering and bicycling -- and fun." Some machines are one-seaters with two wheels; others have many wheels and seat eight. Duane Flatmo, a 51-year-old muralist and graphic artist, built a dragon out of aluminum scrap like muffin tins and colanders. "Any kind of aluminum I could find," said Flatmo, a Eureka resident who's been racing since 1982. "Any time I would go to the junk store, there'd be piles of aluminum stuff, and I said, 'That's my material right there.' "
The dragon, which he and his Biking Vikings team will race again this year, has a trick up its wings. "The head swings from side to side and up and down -- it's all levers and cables," Groves said. "And he can pull a cable that connects to a propane tank, and fire comes out of its mouth." Not that fire has anything to do with racing, but it does relate to fun -- something the event takes seriously. The Biking Vikings wore horned helmets last year. The Hippypotomus team dressed like hippies and played a marimba in the back. A prize is given for the fastest time, but awards also are offered for the sculpture that breaks down first or has the best flip-over in water. Racers can use team-themed pieces of art to bribe judges who catch them pushing their rides. Organizers encourage spectators to follow the shenanigans by standing along the course or by biking it, as long as they follow certain rules. In Twelve Mile, Indiana, organizers of what's billed as the nation's oldest lawnmower race aren't sure why their Lions Club predecessors picked that machine for an annual fundraiser 46 years ago. But with each July 4 race day drawing more than 1,000 people to an unincorporated community where maybe 150 live, they aren't about to second-guess. But even the regular engines can be altered, and most of these machines can get up to 35 mph, organizer and Lions Club member Mark Lowe said. The "modified" machines can go much faster if a rider is so inclined, he said. However, the races -- each featuring up to 33 drivers, like the Indianapolis 500 roughly 80 miles to the south -- have a 15 mph speed limit because officials don't want out-of-control machines on the winding dirt track. Drivers caught speeding are penalized, but the winners still average above 15 mph. Racers aren't forced to remove the blade decks, but virtually no one races with them because no one wants them impeding their speed, Lowe said. Spectators pack the park and watch from lawn parties at nearby homes. Adults at the park pay $5, and kids 12 and under are charged up to $1. Winners normally get a used car from a local dealer, though the economy may force a different prize this year. Fat Tuesday. Mardis Gras. Shrove Tuesday. Whatever you call it, the women of Liberal, Kansas, and Olney, England, know it's the day they run their pancake race. The International Pancake Day race is a friendly Liberal-Olney battle that's been happening since 1950. Women in Olney, donning aprons and head scarves, run a 415-yard race on an S-shaped street course while holding a skillet with a pancake at 11:55 a.m. the day before Lent. Women in Liberal -- they have to be residents -- do the same when that time hits Kansas six hours later. Why? In 1445, a woman in Olney was late to church on Shrove Tuesday. She'd been making pancakes, and when she heard the church bells, she ran to the service -- carrying a skillet and pancake. Neighbors saw this and a race was born, according to an International Pancake Day Web site. The Olney tradition was revived in the early 1900s. A Liberal man saw a photo of Olney's race in 1950 and reached out to the English town to start the current two-community contest, said Janice Northerns, Liberal's Pancake Day publicity chairwoman. The winners of the two races compare times -- these days by video conferencing -- and an international winner is crowned. Racers have to flip the pancake at the finish to prove they have it. But unlike the woman in 1445, racers aren't concerned what kind of shape the pancake is in. "Most racers hold it in the skillet with their thumb" so they can pump their arms, Northerns said. "If most of it falls out but some remains, that's OK."